Family rafting trips are an American tradition. 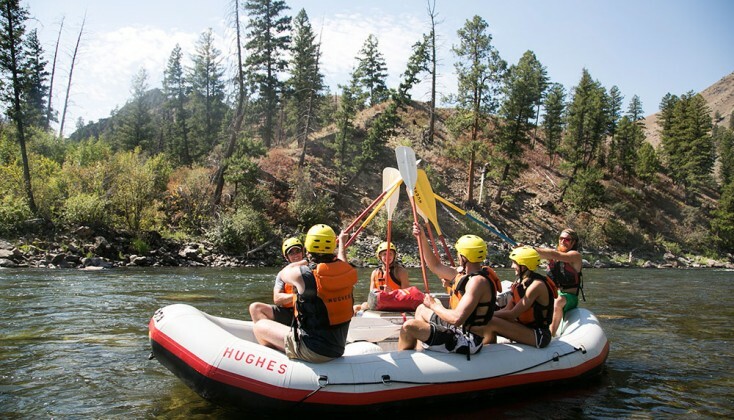 For 41 years, families have made whitewater rafting trips with Hughes River Expeditions, Inc. Our family oriented, safety first, river runs are world class family experiences. Family trips make up 60% of our annual business. Jerry Hughes and Carole Finley have raised their kids on Idaho and eastern Oregon rivers. We enjoy outfitting for families, and we do it well. On the river there are no interruptions from traffic, errands, jobs, or shopping. Don’t worry about scattering at mealtime. Your family will sit down together for breakfast, lunch, and dinner. Other families will usually travel with you. Many lifetime friendships begin “on the river”. A family rafting trip is a great three generation adventure with kids, parents, and grandparents. The guides can help a young angler catch that “first fish” or pick the best dry fly for an advanced fisherman. 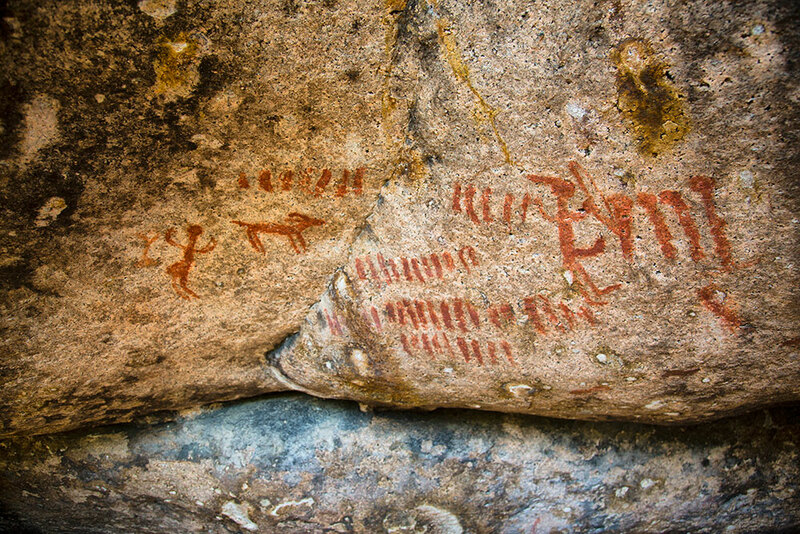 The trip pace provides time for hiking, exploring, and relaxing. 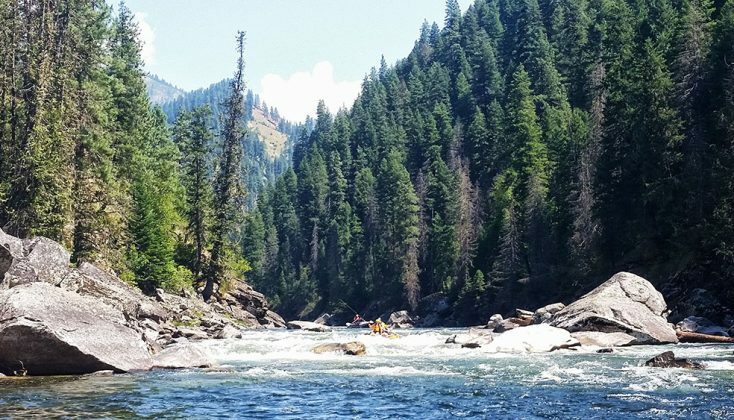 Kids and adults love volleyball or frisbee on pure white Salmon River Canyon sandbars, or inspecting an exotic American Native cultural site on the Middle Fork. Our river library contains books, articles, and other information about the area. All camping gear is provided. 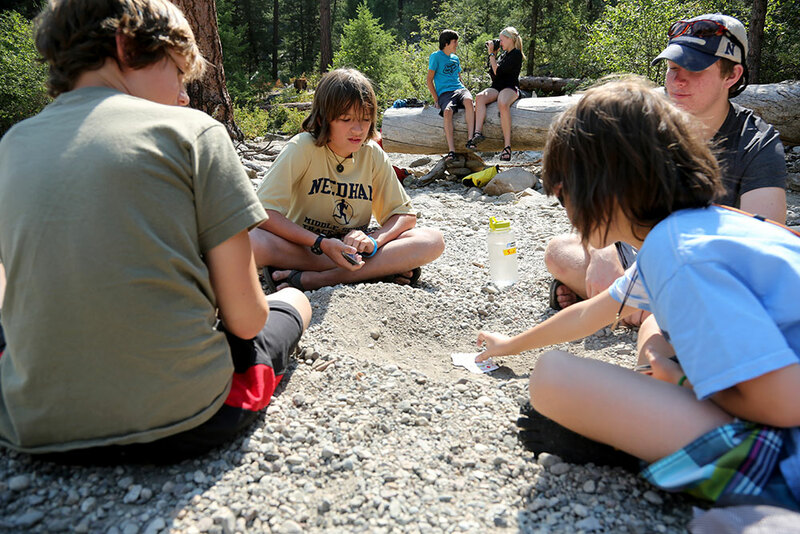 The guide crew does the camp work and cooking, so you can spend time with your family. Mom’s: The guides set up, cook, and cleanup. You can read a book, swim, fish, hike. You can find the “right” trip with HRE. Our variety of rivers and equipment assures a trip that fits your experience, interests, and needs. We can plan an introductory trip for a family with young children, and we can organize a challenging white water run for athletic teenagers and young adults. Safety is our first concern. Life jackets are always worn on the water. The guides know how important safety is, and they understand how important safety is to you. Most Hughes guides range from 25 to 65 years of age. We also work with some college aged guides who add enthusiasm to the team. Many of the crew have guided professionally for 20+ years. Meals are fantastic, and we are happy to provide “kid’s” food (burgers, hot dogs, PBJ, “some mores”) . Let us know your children’s favorites. We’ll serve our normal adult menu and plenty of extras that kids will love. There is unlimited potable water, plenty of ice, and a generous complimentary supply of beverages. You are welcome to bring any favorite beverages. Evenings and mornings on the river are special. There’s nothing like snuggling into a cozy sleeping bag, chatting beside a glowing campfire, enjoying a clear night sky, or waking to the aroma of camp coffee and the sound of the river racing past camp. Call us at 800-262-1882 or e-mail so we can help you pick the trip that is right for your family. 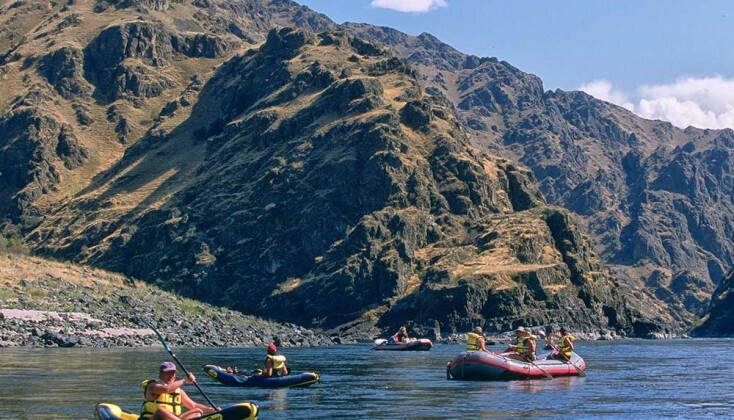 “The Great American Raft Trip” is a unique and valuable tradition. We invite you to join us “on the river”. Thank you for a great trip….Your guides and son Colin were great & getting to know them was a great part of the trip for me. Most of all it was a pleasure to be on the water with people who are so passionate about rivers & wilderness. Thanks for a fantastic trip. You run a first class operation and I feel very fortunate to have been a part of this trip. There is not a week that goes by that someone in the family doesn’t start reminiscing about what a wonderful experience our vacation was. Although we each took away something different from our wilderness adventure, I was thrilled we were able to experience it together as a family. Your guides were nothing short of exceptional and outstanding! I can not say enough about your obvious philosophy on how to treat your customers. 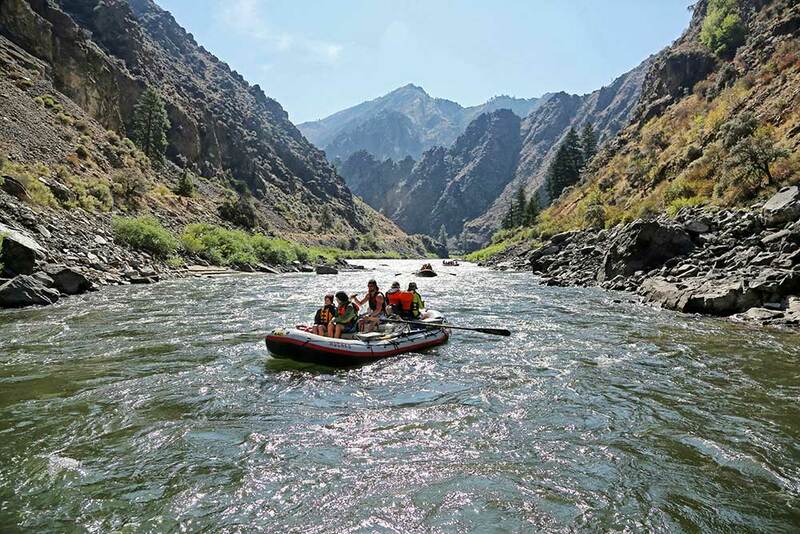 Many thanks for your exemplary customer service and interactions during last week’s river trip…I’m looking forward to an opportunity for a return trip and would not hesitate to recommend you to friends considering a similar trip. Our group had a great trip… We couldn’t say enough about the crew, still talking about them the next day. Great guys, didn’t make me miss Buzz from my last trip, but then you didn’t tell me that I’d have Buzz’s son on this trip! The guys were talking about the Middle Fork trip and the Snake Canyon, so maybe I’ll be back soon. Just a quick note to tell you that our group that participated in the July 8th Middle Fork trip had the trip of our lives. All the experiences will never be forgotten. Your guides were the most professional I’ve ever been on a trip with. Everything from the safety first approach to the great meals was first class. Thanks for the great time! I cannot tell you what a wonderful time we had. It was one of the best experiences I have ever had. Paul and the kids were beyond thrilled and are already planning when to come back. It was beautiful, you and your staff were wonderful. Paul recharged (away from his Blackberry, cell phone and computer), and the kids realized what it’s like to be a kid in a technology free atmosphere! …(W)e will also try to organize a large group of our friends most likely in 2013 but quite possibly next summer. We had a fantastic time and will definitely be rafting with you again. The guides were great in every aspect and it made the trip that much more enjoyable. They exceeded our expectations and that was hard to do. The food was delicious and I never felt like I was missing out by being gluten-free… they even made cakes and brownies for me.